iPhone 8 Plus is a new generation of iPhone. Designed with the most durable glass ever in a smartphone and a stronger aerospace grade aluminum band. Charges wirelessly.1 Resists water and dust.2 5.5-inch Retina HD display with True Tone.3 12MP dual cameras offer improved Portrait mode and new Portrait Lighting.4 Powered by A11 Bionic, the most powerful and smartest chip ever in a smartphone. Supports augmented reality experiences in games and apps. With iPhone 8 Plus, intelligence has never looked better. 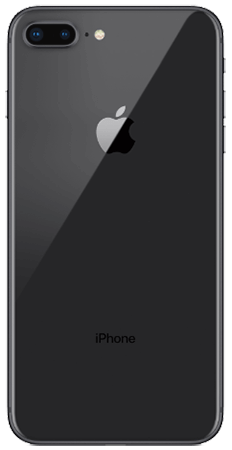 iPhone 8 and iPhone 8 Plus are splash, water, and dust resistant and were tested under controlled laboratory conditions with a rating of IP67 under IEC standard 60529. Splash, water, and dust resistance are not permanent conditions and resistance might decrease as a result of normal wear. Do not attempt to charge a wet iPhone; refer to the user guide for cleaning and drying instructions. Liquid damage not covered under warranty. Portrait Lighting available in beta. Go to www.apple.com/iphone-8/specs for a complete set. USB Power Adapter and Documentation. 12MP dual cameras with dual OIS, Portrait mode, Portrait Lighting, and 4K video up to 60 fps4. 7MP TrueDepth front camera with Portrait mode, Portrait Lighting4.